The Hunter QuietFlo 401 is a good air cleaner for a large room. It will clean a 403 square foot room. 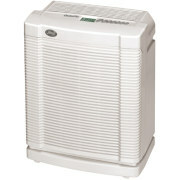 This is a great air purifier to put into a master bedroom, living room, or dining room. It retails for $265. The Quietflo 401 uses a HEPA filter. This kind of filter is capable of removing up to 99.97% of air born particles 0.3 microns and bigger. It can remove most dust, pollen, and other allergens. There is also an activated carbon, pre-filter. Activated carbon is good for removing odors and chemicals. We think there is not enough activated carbon to do an effective job. Don't expect this air purifier to remove many odors. If you really need odor and chemical removal think about an air purifier by Austin Air, IQAir, or AllerAir. The QuietFlo 401 has two filters that must be replaced. The pre-filter has to be replaced every 3 months. They cost about $28 for a two pack. The Hunter HEPA filter is good for one year. It cost $60. This model can be programmed. It will automatically change the fan speed up to 4 times a day, 7 days in a week. Be sure not to leave it on automatic at night if you use it in the bedroom. It can suddenly change speeds in the middle of the night. When it speeds up, it can really scare you wide awake. This will clean up to 400 square feet. That's a room 20 feet X 20 feet. In a room this size you will get 6 air exchanges an hour. We think this is pretty good. In fact we recommend a minimum of 6 exchanges an hour. The fan has 3 different speeds. Only the lowest speed will be whisper quiet the two higher speeds are a bit noisier. It measures 18 inches X 11 inches X 22 inches (L X W X H). This is a good air purifier to use in a large size room. We like the HEPA filter. It will remove most allergens. We don't like the carbon pre-filters. They will keep the larger particles from clogging up the HEPA filter. However, we think there is not enough carbon to do an effective job removing odors. If you are not concerned about odor and chemical removal, the Hunter QuietFlo 401 will do a good job. We also don't like the maintenance cost. We think that $116 a year is a lot to pay for replacement filters. This is less than the QuietFlo 90 or 85, but it is still a significant amount to pay. We think that this air purifier performs well. Anyone with alleriges and asthma will see a reduction in their symptoms. Someone who just wants cleaner air will also be pleased. We have no problems with the quality of this purifier. Our biggest concern is with the high upkeep cost. So before yo buy one of these, be sure to consider how much it cost each year to operate it. Leave Hunter QuietFlo 401 Page and Return to Hunter Air Cleaners Page. Leave Hunter QuietFlo 401 Page and Return to All Abour Air Purifiers Home Page.